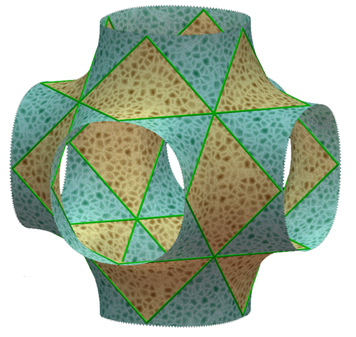 Surfaces studied by Schwarz in 1864, then by A. H. Schoen in 1970, who gave the abbreviations "P" and "D". 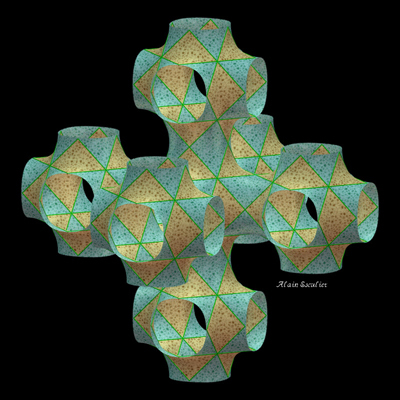 Hermann Amandus Schwarz (1843-1921): German mathematician. 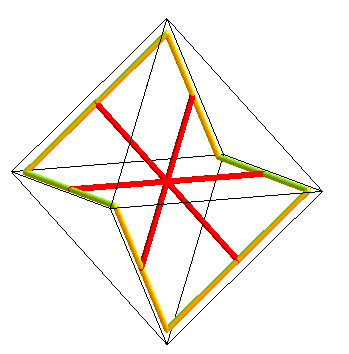 The Schwarz "D" (for diamond) minimal surface is the triply periodic minimal surface the fundamental patch of which is the solution of the Plateau problem for a contour that is one of the 6 skew quadrilaterals made from a skew hexagon inscribed in the edges of a cube, as represented opposite. 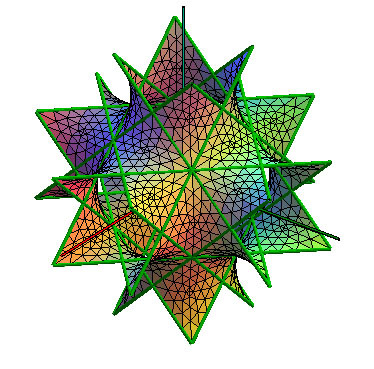 The Schwarz "P" (for primitive) minimal surface is the surface built similarly to the previous one from a skew hexagon this time inscribed in the edges of a regular octahedron. 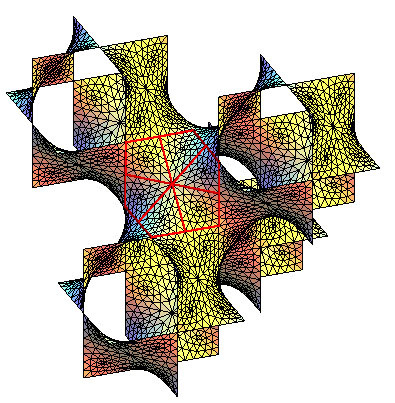 Skew hexagon, base of the Schwarz D surface, composed of 6 skew quadrilaterals; the yellow edges are 6 of the 12 edges of a cube. 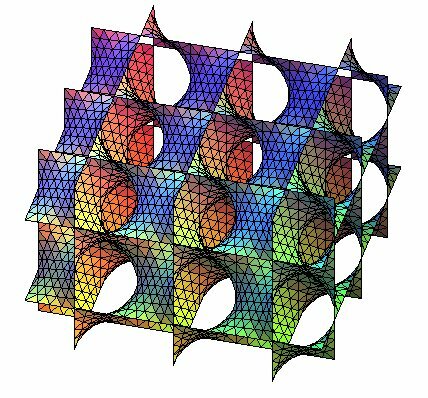 Each Plateau quadrilateral has 3 right angles, an angle of 60°, and two sides equal to sqrt(2) times the other two. 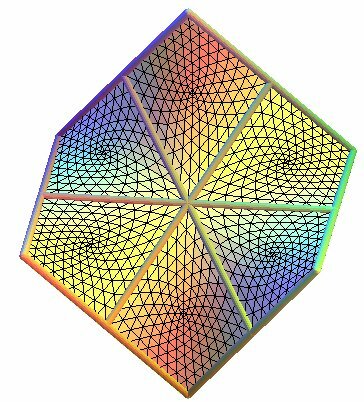 Skew hexagon, base of the Schwarz P surface, composed of 6 skew quadrilaterals; the yellow edges are 6 of the 12 edges of a regular octahedron. 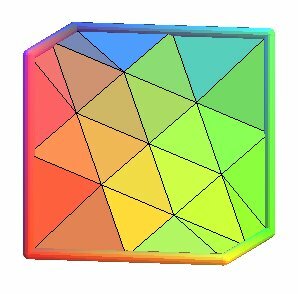 Each Plateau quadrilateral has 2 right angles and 2 angles of 60°, and 4 equal sides. 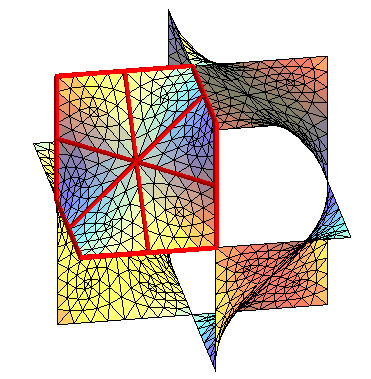 The Plateau solution for a skew quadrilateral is not, like it could be hastily thought, a portion of hyperbolic paraboloid (HP) the generatrices of which are its sides, and one will find, here for Schwarz D, and here for Schwarz P, the exact calculation of this solution (and one will find in these articles that the two surfaces are conjugated by the Bonnet transform): the Weierstrass parametrization is obtained with , for D and for P.
In the opposite views of the 6 surfaces supported on the 6 skew quadrilaterals, we used a triangulation method that provides a surface supported on the considered contour, but which is not the Plateau surface; the method is detailed at the bottom of this page. 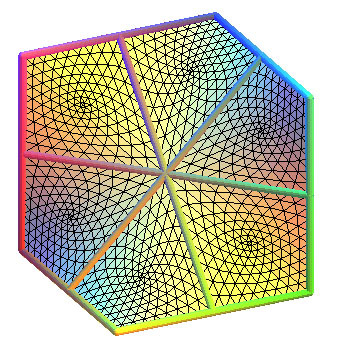 The complete Schwarz D surface is obtained by applying the 6 symmetries with respect to the 6 sides of the base hexagon and iterating to infinity. 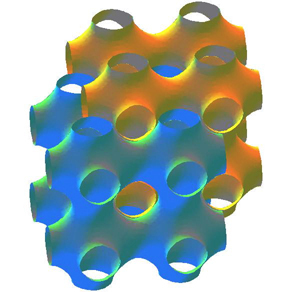 The complete surface is obtained by translations of this composition of 4 base hexagons. 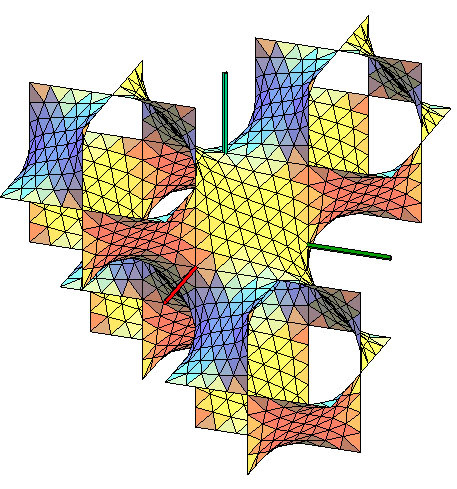 The complete P surface can be seen as a network of pipes crossing at right angles (hence the nickname of "plumber's nightmare"). 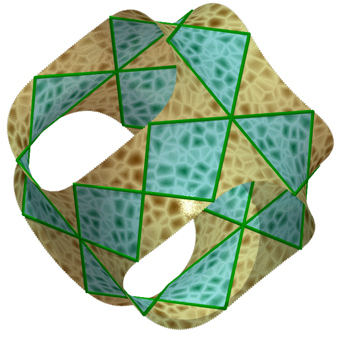 Pattern composed of 26 fundamental quadrilaterals. 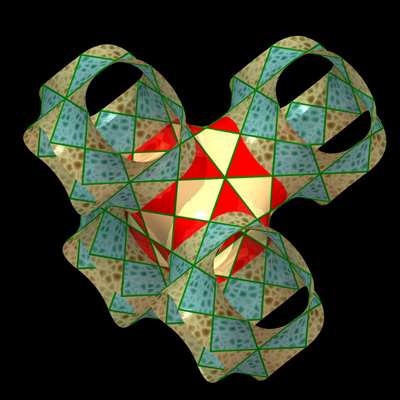 By replacing the Plateau quadrilaterals by portions of hyperbolic paraboloids, we get the sculpture by Angel Duarte in Lausanne. 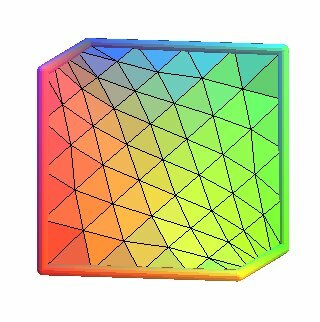 If half of the 24 quadrilaterals of the previous pattern are carved out, we get a pattern that generates the entire surface by translations. 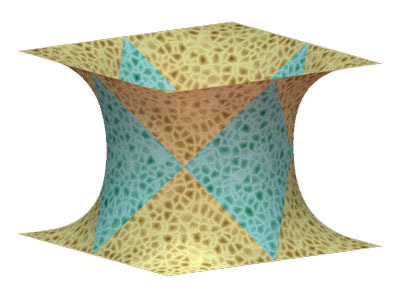 This concrete construction shows how the complete sphere is built based on the previous pattern, and also shows that the surface splits the space into two connected parts that can be superimposed (the inside of the pipes is isometric to the outside). 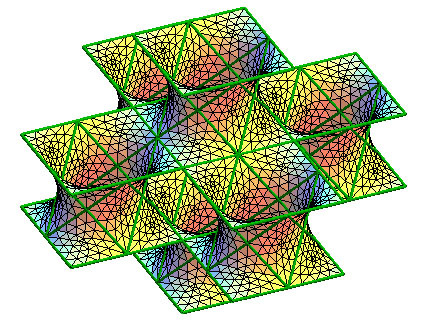 The complete D surface can be seen as a network of pipes crossing at angles of 109°28', like the segments joining the center of a regular tetrahedron to the 4 vertices. 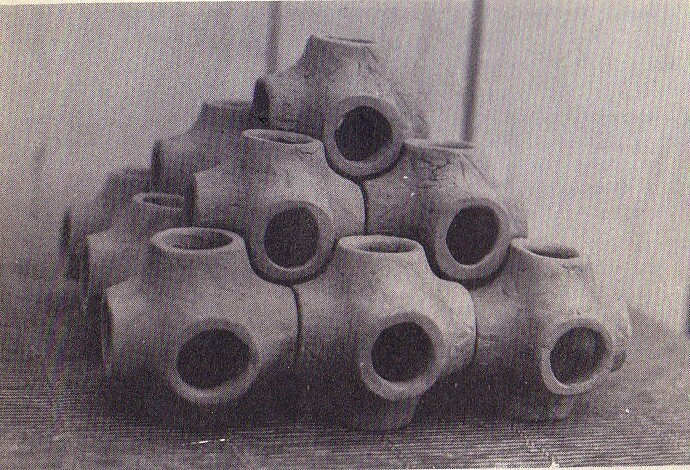 Here also, the inside and the outside of the pipes can be superimposed. 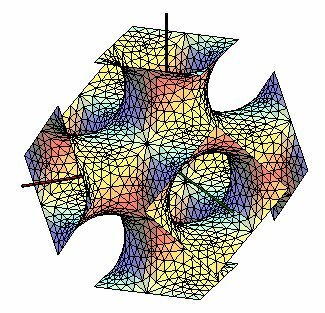 The D and P surfaces can be approximated by so-called "nodal" surface with respective Cartesian equations: and , they are also triply periodic, but not minimal. 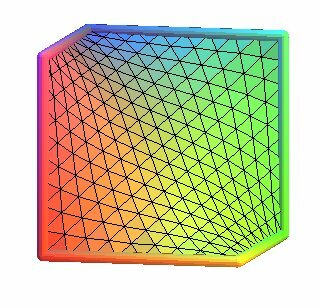 If the side is on the contour: then the point really is the middle of this side. 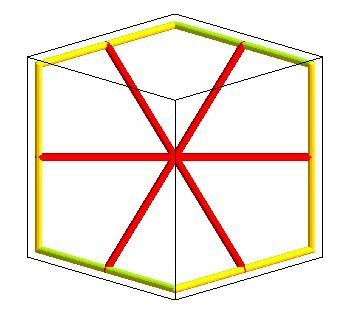 If the side is not on the contour: then the point is the barycenter of the vertices of the faces that have this side in common (therefore the ends of the common side count twice). 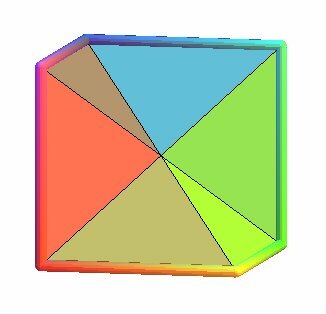 The triangle is then split into 4 smaller triangles, the vertices of which are those of the initial triangle plus the 3 points defined. 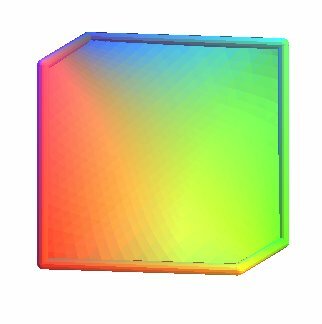 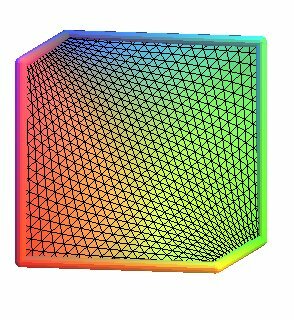 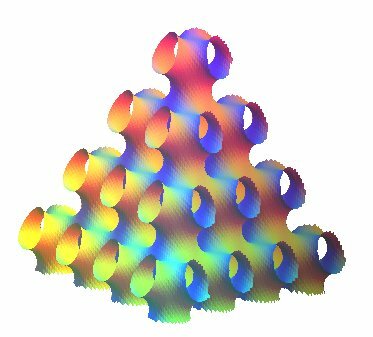 See also the Neovius surface and the gyroid, minimal surfaces that have the same Weierstrass representation as the D and P surfaces, but another Bonnet angle. 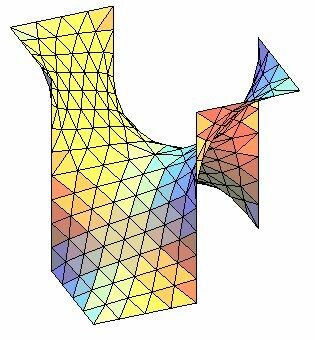 Engravings of Schwarz surfaces with asymptotic and curvature lines, by Patrice Jeener, with his kind authorization.